El canal de Panamá es considerado una de las maravillas del mundo. Le ha costado sangre a través de nuestra historia a los panameños recuperar su administración y soberanía. El problema de la ACP no es solo de la presente administración, este problema viene de administraciones pasadas. Y que hoy, toda la basura de las administraciones y su pésima gestión esta saliendo a flote. Entre estos problemas los presupuestos adquiridos para la construcción de la última esclusa el cual no reúne la calidad esperada y deseada en su infra estructura ya que tiene problemas de filtraciones. En la actualidad aun no se determina con exactitud si está, quedo reparada del todo o solo por el momento. Desde cuando la autoridad del canal de Panamá esta violando los Derechos Ambientales a través de las construcciones, de las esclusas, proyectos e infra estructuras? Desde hace varias administraciones pasadas, ya que son empresarios, comerciantes, quienes lo administran y ven todo como negocio sin tomar en cuenta que el ambiente es un recurso invaluable que se puede agotar. La contaminación a nivel ambiental y la destrucción de nuestros recursos naturales han aumentado a gran escala en las 3 ultimas décadas, sin que nuestros gobiernos tomen medidas extremas para la preservación de nuestras riquezas. Hoy día vemos la cantidad de ríos, lagos y hasta lo que forma parte de nuestro territorio oceánico contaminado a gran escala. A eso, le agregamos la falta de conciencia ciudadana, el poco interés por la educación del tema y la falta de medidas legales ambientales que se deben aplicar. Una de las inconciencias mas grandes fue la aprobación de los culecos en el carnaval 2016, solo por política y mantener contentos a las masas que hoy día son los primeros en quejarse, cerrar calles, protestar cuando nuestros gobiernos por falta de capacidad para resolver este tipo de problemas de escases de agua no brinda ni respuestas, ni soluciones concretas efectivas para todos. El agua es uno de los tres recursos mas importantes e invaluables de la humanidad. Para desarrollar proyectos alrededor del Canal de Panamá, hay que cumplir con una serie de normas ambientales, ya establecidas. Cada vez vemos a mas políticos sin planes de gobierno aspirando a puestos y al poder para lucrar, sin conocimiento científico y sin responsabilidad social, manipulando las leyes y creándolas a su beneficio. Existen normas nacionales e internacionales que nos obligan a respetar el medioambiente, pero estas no se cumplen, las ignoran, las ocultan porque no la exponen para conocimiento publico. Uno, no juega con los recursos del país, del Estado, El Canal de Panamá es una de las maravillas del mundo, tenemos que cuidarlo puesto que es de todos los panameños, el Canal de Panamá no pertenece a ningún gobierno, a ninguna administración, a nadie pudiente de ningún apellido, que recuerden que solo son administradores, todos formamos parte del Canal y nos costo históricamente recuperarlo, no esta en venta, no es una empresa privada, el agua no esta en venta, no es un negocio, y todos dependemos de ello. Señores el Karma social y político existe, creas o no, en él. The twin factors of cellular overcapacity and rock-bottom bunker costs have, over the past year, led carriers to divert multiple sailings away from the world’s two principal trade arteries and reroute vessels around the southern African cape. Its six-month report for the second half of 2015 quoted analysis from SeaIntel (portoverviw.com co-owner), which showed that since the end of October 2015, 115 vessels deployed on Asia-USEC and Asia-North Europe services have made the back-haul trip to Asia by sailing round the Cape of Good Hope rather than through the canals despite using them on the headhaul legs. Three of these vessels were deployed on Asia-North Europe services, while the remaining 112 were returning to Asia from the US east coast. 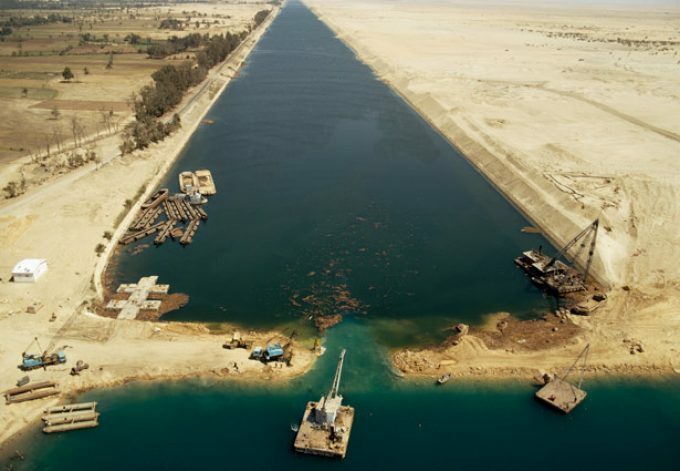 “Normally, 78 of those voyages would have gone through the Suez Canal, and as 53 of the voyages were in 2015, it would have meant that the number of container vessel passing the Suez Canal in 2015 would ‘only’ have decreased by 1.9% year-on-year, instead of the reported 2.8%. The other 37 vessels would normally have passed through the Panama Canal,” portoverview.com said. “SeaIntel concludes that both the canals face a significant challenge in the current low bunker price, as it means that for many services it is cheaper to sail south of Africa on the backhaul than to use the canal routings,” it added. It is even viable for sailings from North Europe to Asia to route via South Africa, “if the intermediate calls were dropped or switched to other services”, it said. There is a further, compelling, reason for carriers to route via South Africa: in addition to avoiding canal transit fees, the elongated sailing route, which adds another week to transit times, could potentially “soak up” between 60-80 vessels, of which half would be ultra-large container vessels, and take out some of the industry overcapacity which is causing freight rate volatility. Not everyone sees the artistic potential in the current construction of a new Tappan Zee Bridge. But Bartholomew F. Bland does. Mr. Bland’s enthusiasm for scaffolding, hard hats, winches and pulleys can be explained by a visit to “Oh Panama! 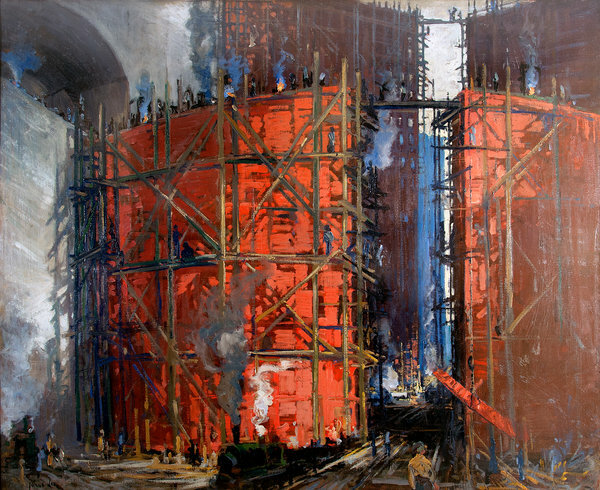 Jonas Lie Paints the Panama Canal,” an exhibition that began in February and runs through May 8 at the museum in Yonkers. The exhibition, curated by Mr. Bland and Kirsten Jensen, chief curator of the James A. Michener Art Museum in Doylestown, Pa., where the show will travel next, follows a burst of creative energy that gripped Mr. Lie (pronounced “Lee”), a New York landscape artist, in 1913. Giving Mr. Lie’s painting spree liftoff was a documentary on the near-completed Panama Canal. “Lie went to a New York movie house and saw a very, very early color movie called ‘The Making of the Panama Canal’ toward the end of 1912. He was so intrigued by it he was convinced he had to get there,” Mr. Bland said on a recent tour. A 1913 book of hand-colored photographs illustrating images Mr. Lie might have seen in the film — massive machines entrenched in muck and mosquitoes thousands of miles from civilization, terracelike steps down to a 40-foot deep canal bed where men laid tracks and placed dynamite — is among a few dozen artifacts arranged in glass cases in the show. So is a postcard that was on sale to Panama City tourists that shows Hercules prying open the earth. Mr. Lie, who was born in Norway in 1880 and died in New York in 1940, was not the only one who packed his bags and his paintbrushes and headed to Panama to witness what is still considered one of humankind’s most ambitious feats of engineering. 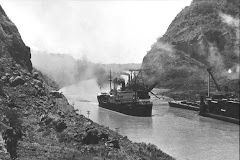 For those with a tenuous grip on the history, a primer: The construction of the 48-mile Panama Canal across the Isthmus of Panama linked the Atlantic and Pacific Oceans. France began the project in 1881, but it was taken over by the United States in 1904 after tropical diseases including malaria flattened French work crews, killing more than 20,000 people and bankrupting the project. The building of the canal was undertaken to allow ships to avoid the lengthy Cape Horn route around the southernmost tip of South America, creating a shorter route to the West Coast of the United States and to countries in and around the Pacific Ocean; those ports and countries could then be better integrated into the world economy. The United States, propelled by the determination of President Theodore Roosevelt, took a decade to build the $639 million canal, employing a total of 56,000 workers for the job. It was officially opened in August 1914 (though it, like the Tappan Zee, is also busy with construction; the Panama Canal Expansion Project, which will open a third, wider lane of locks, is expected to be completed this year). For Mr. 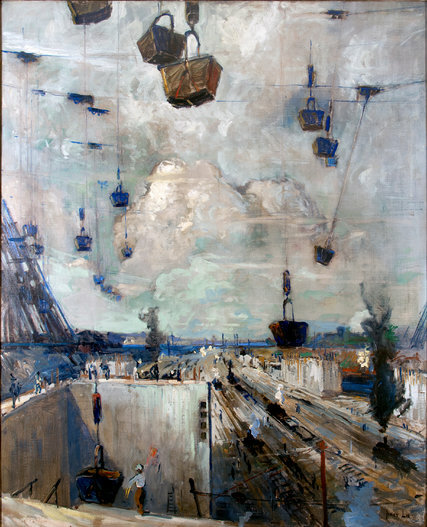 Lie, the near-completed canal of 1913 presented an opportunity to build on a budding reputation as an artist of the moment. Mr. Lie made roughly 30 paintings during the three months he spent in Panama, but the artwork wasn’t unprecedented. A book of views by Joseph Pennell, “Building the Panama Canal,” had been published in 1913 after Mr. Pennell visited the site in 1912. “At first Lie thought Pennell had covered the territory” with his book of black-and-white lithographs, Mr. Bland said. But he came to realize the book was more reportage than art, and convinced himself that the visual story of the Panama Canal had to be told in color. 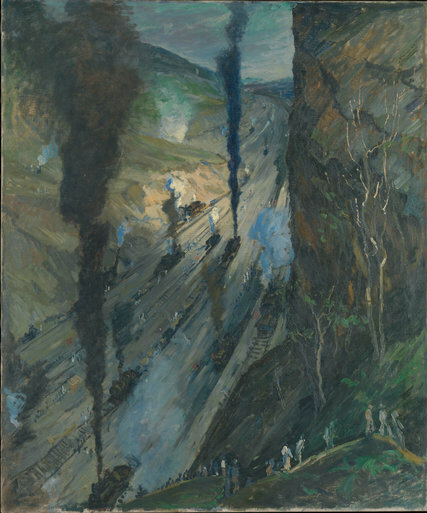 “Oh Panama!” collects 14 of Mr. Lie’s man-versus-nature-themed Panama Canal paintings, including “The Conquerors,” on loan for this exhibition from the Metropolitan Museum of Art. The 60-inch-by-50-inch work is the centerpiece of the show, depicting part of a nine-mile stretch of mountains being blasted away by dynamite. “It looks like hell, like an inferno,” Mr. Bland said of the painting. “There’s all this black smoke.” Blues, whites and earth tones surrounding the smoke and machines are vivid, though, demonstrating Mr. Lie’s painterly skill. Eleven of the paintings, including “Heavenly Host,” in which buckets of concrete hover in the sky before being dropped to workers below, were lent by the West Point Museum at the United States Military Academy. “They ended up there because of General Goethals’s involvement with the military,” Mr. Bland said, referring to George W. Goethals, eponym of a New York bridge, who was chief engineer of the canal, appointed by Roosevelt in 1907. “He knew Lie and admired his work.” In 1928, an anonymous donor bought the series and presented the paintings to the academy “in memory of the West Pointer who, as chief engineer, was most potent in channeling the isthmus,” a notice in Time magazine read. Mr. Lie’s Panama Canal series has never been shown as a complete group. “They’re usually rotated in and out, one at a time, at West Point, because they’re not really set up for fine-art appreciation there,” Mr. Bland said. That makes the Yonkers show, which also includes three lithographs on paper borrowed from Vesterheim: The National Norwegian-American Museum and Heritage Center in Decorah, Iowa, especially important to an admittedly small group of potential visitors: Jonas Lie fans.